It’s blueberry season in Florida! We love these little blue gems fresh, but also enjoy them in various recipes. Muffins, pancakes, and breads come to mind, but they are so good in their raw form that you might want to try them in raw recipes, too. Today’s recipe combines two super fruits–the blueberry and it’s side kick, the apple. Try this as it is, with fresh whipped cream, or keep it vegan with the vegan whipped cream recipe I’ve included. 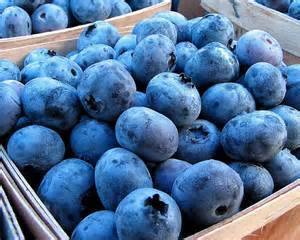 Blueberries are high in anti-oxidants and are a good source of several vitamins and minerals. They make an excellent jam, can be blended into your green smoothies, and are delicious atop your salad, too. Such a versatile and nutritious fruit should be enjoyed often! In a food processor, pulse the ingredients until they form a coarse meal. Press half of the mixture into single serving ramekins.. In a food processor, blend one apple, 2 cups blueberries, and the remaining ingredients until smooth. Add the two remaining apples in the food processor and pulse into small pieces. Add remaining blueberries and pulse just a moment to mix. Do not over blend – it’s best with small chunks of fruit. Pour the filling onto the prepared crust. Sprinkle the reserved crumble mixture on top. It’s also very flavorful when warmed to release the flavors. Chill coconut milk for several hours or overnight. Spoon out the thick creamy white part of the milk; set aside the watery remainder to enjoy in a smoothie or other recipe. In a large bowl, whip the coconut cream on high until medium firm peaks form. **You may refrigerate this a few days, but it will lose its consistency and will need to be re-whipped.